This State Park is a Hollywood Western Movie Site that you can ride! 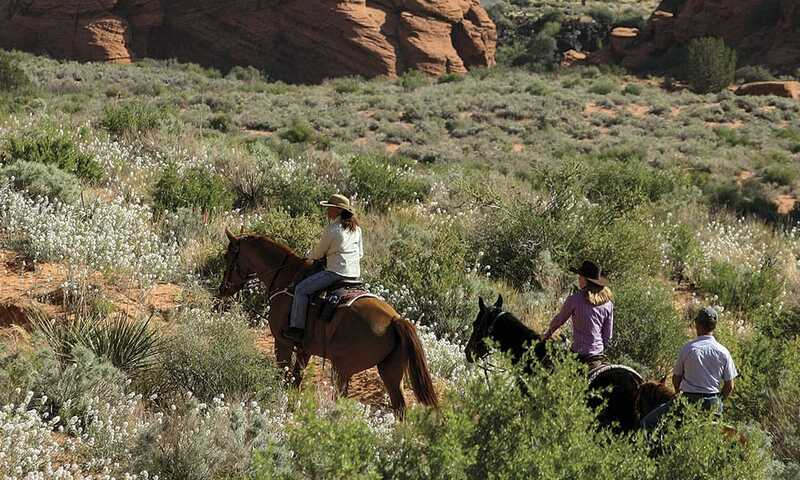 Darley and Patty Arnett ride the wistful trails of Snow Canyon State Park in Utah. An underrated park that you might want to have on your radar has visuals straight out of a classic Western movie, and you might have seen this park in Hollywood films if you’ve watched any of the classics. 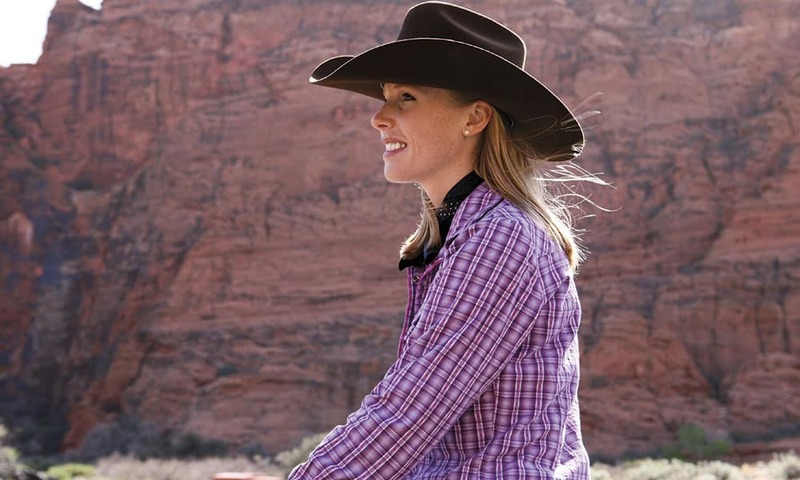 Riding here, you’ll certainly have plenty of places for cowgirl photos that will make your friends at home—and maybe even your horses—jealous. Snow Canyon State Park in St. George, Utah is not one of the most visited parks in Utah. 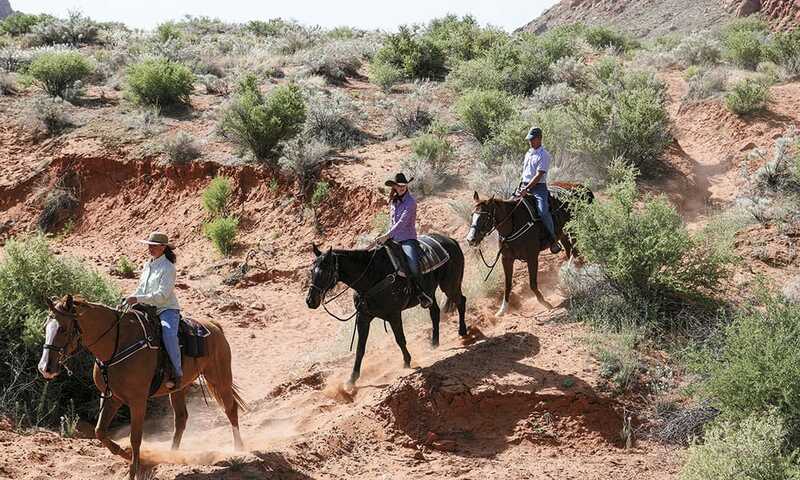 It sometimes gets missed for the grander Bryce Canyon, Capitol Reef, and Zion, but it’s worth the trip to this park in the Southwestern part of the state because of its striking scenery and outfitter Patty Arnett’s award-winning horses. As I rode out from our meeting point on Itos, an 18-year-old dark bay Dutch warmblood, I could feel that I was on a special horse. Darley and friends against the stunning backdrop of Snow Canyon scenery. The sire of all of the horses that our small group was riding, including Itos, placed eighth in the 2002 Atlanta Olympics, and it wasn’t because of the special occasion of our filming that I was given Itos as my partner. He’s one of Patty’s well-bred horses that visiting riders can mount if they are heading out with Patty to explore the park. I made a mental note of yet another reason to ride in the Snow Canyon: Olympic-quality trail horses. The park is named after Lorenzo and Erastus Snow, leading Mormon settlers. Snow Canyon’s unique geology makes it attractive to modern-day riders, but the towering white and red Navajo sandstone canyons, juxtaposed with dark lava rocks, have long attracted Paiute and Anasazi indians, Mormon settlers, and Hollywood filmmakers. It also attracts distinctive wildlife, such as peregrine falcons, leopard lizards, gopher snakes, and giant desert hairy scorpions, said to be the largest scorpions in North America. Upon learning of that fact, I was glad that I wouldn’t be camping out in the park, something that is available to those who visit. As we rode along a rocky portion of the trail, Patty told us that we were passing over an area where lava once flowed. The park’s unique geology has been shaped by the elements, including lava flows from as far back as 2.5 million years. All around us were desert plants and wildflowers. The neat thing about riding in Snow Canyon is that as the sun moves across the sky, different aspects of the canyon walls are illuminated, so the scenery is constantly changing as new colors are brought to life. All along the ride, Patty and I used our imagination to see what we could find within the sandstone walls. We spotted rock formations that looked like bears, the gopher from Caddy Shack, and an eagle head. We must have had wildlife on the brain, as we approached an area with falcon nests in the crux of a rock wall. For bird watchers, this is a highlight of the ride. Unfortunately for us, the falcons were not flying as we passed by. We waited a while and then continued down the trail. Darley Newman and Patty Arnett. What’s most interesting about riding through Snow Canyon is the diversity of the vegetation and geology. I suppose this is why it would be a good place to film a show like ours, and Hollywood movies of the past. The Electric Horseman, Butch Cassidy and the Sundance Kid, and Jeremiah Johnson are some of the famous Westerns that filmed scenes in Snow Canyon. As someone who does a lot of filming on horseback, I could imagine the drama as Paul Newman and Robert Redford navigated through the sand in Snow Canyon in the beginning of the chase scene in Butch Cassidy, when Butch and Sundance keep looking back to ask, “Who are those guys?’’. As we continued our trek, the rocky footing changed abruptly to fine, deep sand trails. “Yeah, we call this the Utah Beach and instead of having ocean, we have a sea of sage,” Patty joked. Unlike the beach, I was enjoying the fact that the park wasn’t crowded. We hadn’t seen any other riders on the trail that day or any other people at all. Perhaps it wasn’t so bad that everyone was flocking to Bryce and Zion, leaving the small, but satisfying Snow Canyon all to us. We rode through a sandy wash and were lucky enough to see a beautiful white flower blooming in the crux of the rock wall. I find it amazing that such delicate things like the roots of a small flower can take hold and thrive in such harsh environments. This is the power of nature. Patty and I dismounted to check out a white flowering plant with small leaves that look like little glasses, called a spectacle pod. Closer to the ground, I was able smell the sage all around us. We climbed up to a high spot to enjoy views of the north end of the park with its pink and white canyons in the distance. As we rested there, I thought about Snow Canyon and all of the other beautiful places that I’ve visited around the world and how lucky Patty is to be able to ride here everyday.